1. 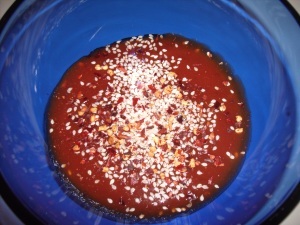 Combine BBQ sauce, honey, and red pepper flakes together in a small bowl. 2. 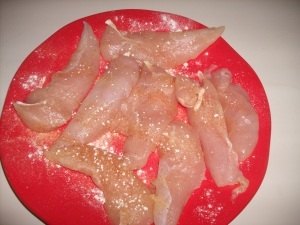 Sprinkle garlic powder and salt (or seasoning of choice) on tenderloins. 3. 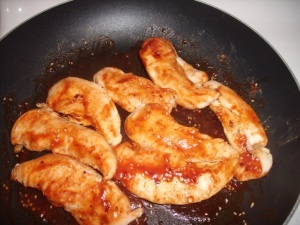 Heat a large non-stick skillet over high heat and spray with non-stick cooking spray. 4. Add in strips, and cook until lightly brown, 3 minutes per side. 5. Turn heat down to low. 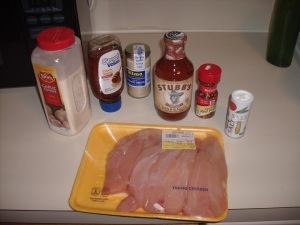 Pour BBQ sauce over chicken and toss until coated and sauce is heated. Serve warm. Awww hell yeah – now we’re talking! When I first saw this recipe, it pretty much grabbed my by the throat and forced me to cook it. Much like my friend Eric Cressey, I too was hooked on chicken fingers during my formative years (along with double orders of curly fries and an awesome hybrid called “chicken fries”, but I digress), so I had to check this one out based on principle alone. Up until recently, a dry chicken breast was the bane of my existence and I would do anything, even make sweet, passionate love to Janet Reno, to avoid having one as part of my menu, but this recipe changed my perspective entirely. To say that my plate was full of win would be an understatement. 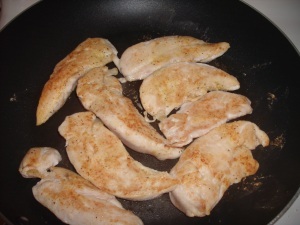 The key to keeping any kind of chicken breast juicy is to pan cook it for about 3-5 minutes per side on medium heat, making sure not to pierce the meat with a fork when flipping it unless you want all of the juice to drain out, leaving you with a dry, mummified piece of meat that would make King Tut look like Stacey Dash. Now that the meat is primed and ready to go, the trifecta of BBQ sauce, honey and red pepper flakes really takes a rather dull piece of meat and snaps it to attention through a combination of sweetness & spice. Most BBQ sauces have at least 20 grams of carbohydrate per serving, and NOBODY just uses one serving of sauce, so it’s easy to see how it could quickly add up, but the sauce that I used only contained 6 grams of carbohydrate per serving without sacrificing taste. This chicken is so good that it’ll make you wanna slap your momma! Taking less than 10 minutes total to cook, I give this recipe 4 thumbs up and then I will proceed to lick the rest of the sauce off said thumbs. If you’re in the market for more healthy & scrumdiddlyumptious foods, click this link here to check out the rest of Leigh’s cookbooks – you won’t regret it one bit. Affiliate note: If you purchase any of her cookbooks by clicking the links on this page, I’ll get a small portion of the sale, but this in no way biases my review. I’ll never promote something on this site that I haven’t used personally or that I don’t think will be a great benefit to you all. That is my promise to you, and if you ever see me slipping on it PLEASE be sure to drag me out into the middle of the street and call me mean and hurtful names while force feeding me dragon boogers. Did I miss these? I don’t recall seeing this recipe in any of her cookbooks that I have. Definitely will have to make this one. I’m a huge fan of boneless chicken tenders but my favorite way to use them is in the crockpot. Oh crockpot, how I love thee! I’ve got about a bazillon recipes. I can share them with you Rog, if you like. Let’s talk crockpot for sure! I just got a huge 8 qt one last week and am feeling a bit intimidated by it. I feel like I could fit a whole cow in there. Yummy indeed! We’re doing a cooking seminar at the gym sometime in the near future, so I’m definitely going to be cooking this one up for the group. Hey Nancy! It is in the Quick and Easy cookbook on page 8. Roger, you are awesome and so is this chicken. That is all. thank you for your visit and the time to drop a few lines. This recipe is delicious, simple and tasty, will give it a try. I consider to buy some books also, it just struck me now regarding the satiety problem: you always want to have more from a tasty dish. Lemme know how it tastes man. I think you’ll love it! Next time i’ll add garlic powder and sesame seeds also.